I am in the process of cleaning the storage building in back of the house. I found the "Toptafel" or "Devil Amongst the Tinkers" game that Dad constructed of cherry wood. When he passed away in 1999, the game was stored away. I found it this week and am in the process of cleaning and restoring it to it's orginal luster. Still have a way to go in the cleaning process. Toptafel, Table á Toupie, is a game primarily popular in America, France, Belgium Holland although it probably first originated in England or France. The correct name for the game has not been ascertained. In North America is often just called "Skittles" which confuses matters since that is the name of the much older European ancestor. Other possibilities are "Racketeer" and "Devil amongst the Tinkers" but whatever the name, the game can be lots of fun albeit almost totally down to pure luck. Being a simple traditional game without governing body, variations of equipment and rules abound. 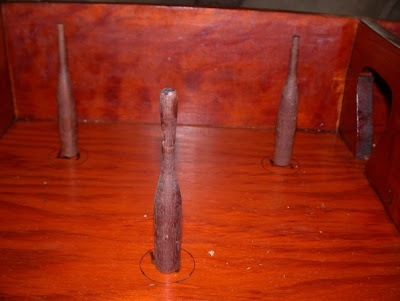 "Devil Amongst the Tinkers" game consists of several skittles or pins (You will notice that Dad tired with making pins so he substituted clothes pins for those pins not completed. 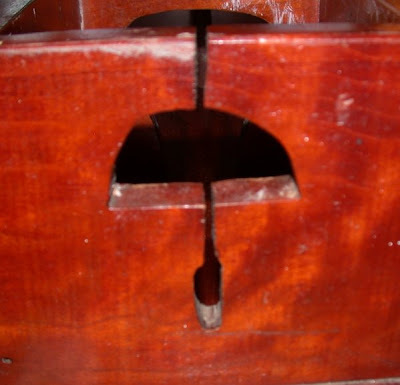 ), a top and a string to launch it (usually with spares) and specially designed table. There are no standards and various designs for the table, skittles and top exist. The table is a rectangular area enclosed by walls on all four sides. Walls within the game segment off several rooms but spaces in the walls allow the tops to enter and leave the rooms. 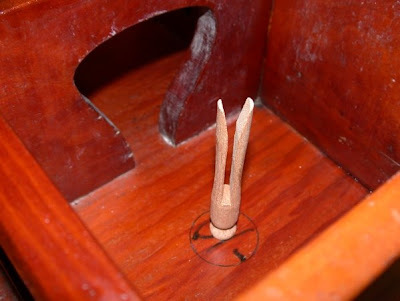 At one end of the table, a hole in the end wall allows a top to rest against the side wall and the string to be pulled through the hole thus launching the top into the game. In each room and in various places in the central area of the game table, a small round circle on the floor of the game box indicates that a skittle should stand at that point. A number within the circle indicates the score that is made by toppling the pin that stands on that circle. Sometimes, a few of the circles have negative numbers within them indicating that this number of points is deducted if that pin is toppled. The rules are simple. 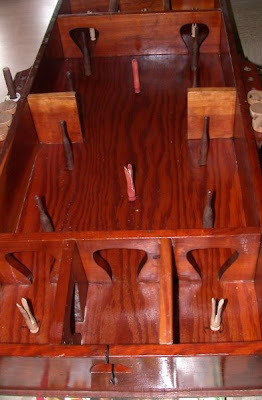 Each turn consists of a single launch of the top into the game table. 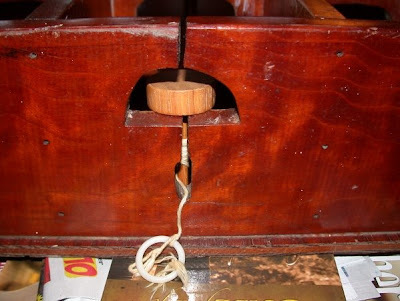 The string is round around the top and the top positioned in it's starting position at one end of the game. 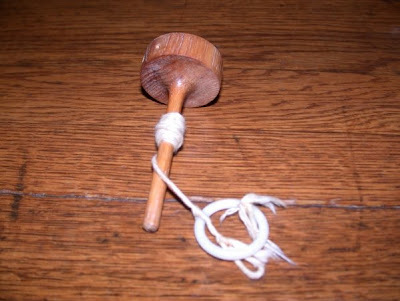 The string is then swiftly pulled away from the table spinning the top into the table. 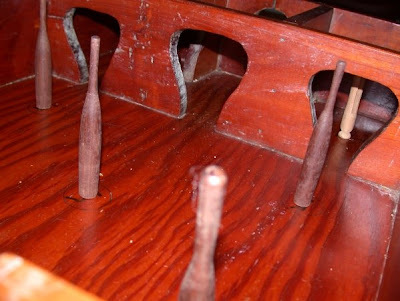 The turn finishes when the top comes to a halt and the points for each of the pins toppled is then calculated. A typical game will consist of each player taking 5 turns to spin 5 tops. The total of the scores at the end determine the winner. Anyone up to a game? This was a great day to work in the flowers. 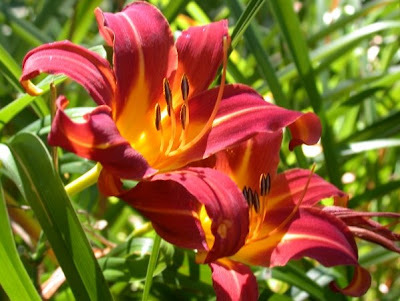 As I have mentioned earlier that the lilies are in bloom. 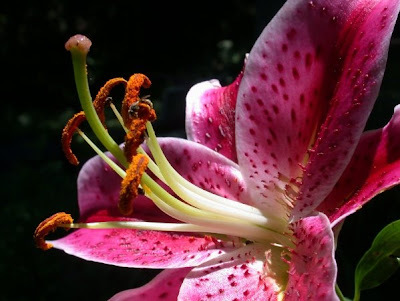 A guy (or gal) has to love the Stargazer Lily. 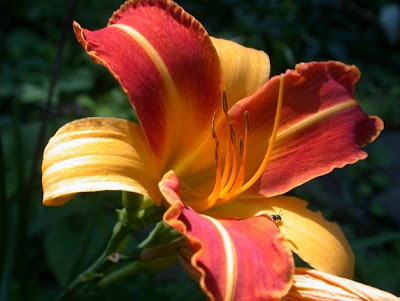 Of the many different lilies that are available today, the stargazer lily is one of the true stand-outs. Its spectacular blooms, which can range in color from pure white to the more familiar shades of deep pink, can make a definite impression. 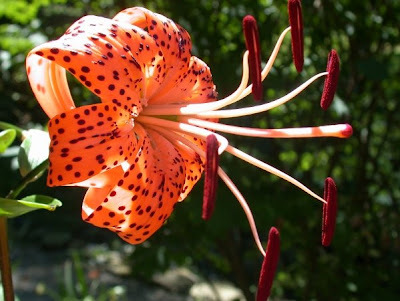 We have a variety of different lilies. Thought you may enjoy these shots. 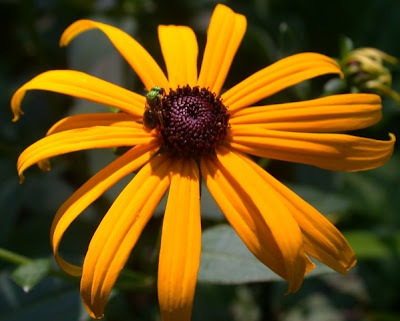 I also love this time of year when the yellow coneflowers show their color. 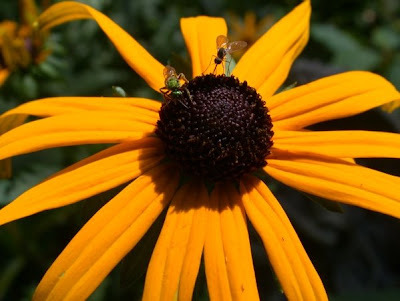 Notice the bees and flies are attracted to these bright yellow flowers. This morning around 7:30 A.M. 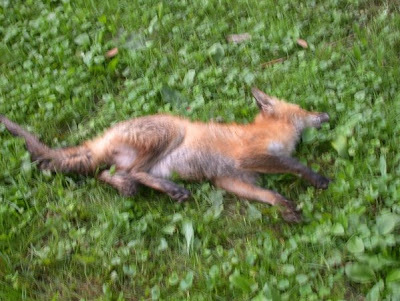 I started to mow the grass and discovered an injured red fox lying in the backyard. The critter was obviously in distress. I netted the beast and placed it on the hill in the woods. 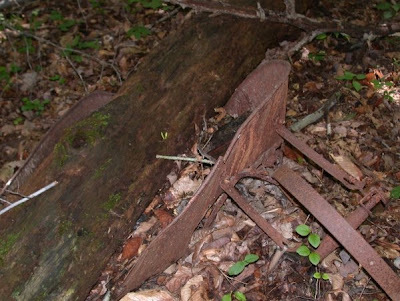 The fox could barely move so I gently put it in a shady woods beyond what I call my bent barrow. 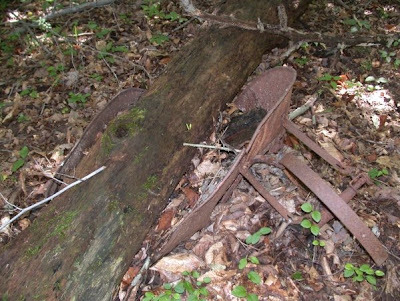 This old wheel barrow was so neat until one night a storm uprooted a tree and it fell directly in the middle of this antique! 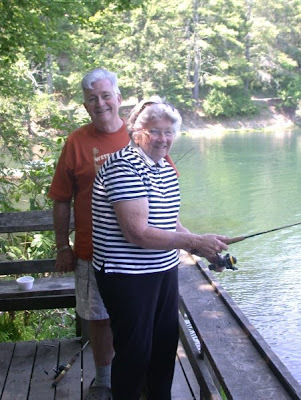 Judy asked if we should call the Game Warden. I assured her that they would not be interested. I went off to get the car's oil changed. Upon returning, the good wife had contacted the DNR game warden. He said that the federal folks would like to collect the fox. (Wife correct again!) The USD Wildlife Division is collecting data on rabies. 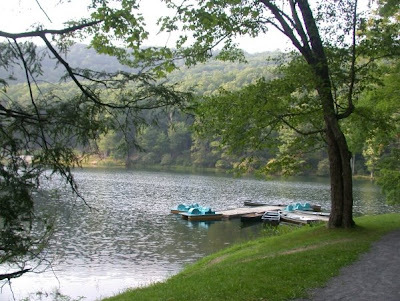 They have a vaccine bait line extending through Central West Virginia so they are interested in seeing if any rabies cases gets past the bait line. Gilmer County is about directly on the line. Woodland creatures partial to fishy snacks find apparent gifts descending from the heavens: fishmeal cakes dropped into their midst that, once devoured, will deliver a rabies vaccine. Pilots contracted by the U.S. Department of Agriculture fly over portions of the East, including our section of West Virgina, in an aerial effort to contain — and eventually eliminate — the rabies virus in the raccoon population. The effort's official title is the National Oral Rabies Vaccination Program. 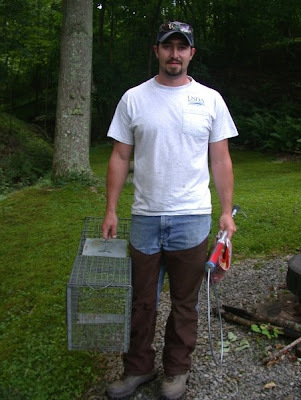 Jason Miller of the USDA arrived and was ready with his fox collecting equipment. 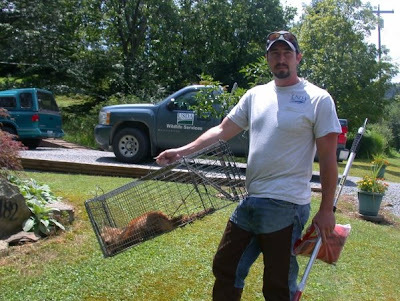 Jason placed the fox in a cage and indicated that he will test the fox for rabies. He said that the fox was not acting as if under the influence of the rabies virus, nor did it look as if the beast had distemper. His guess was that it was hit by a car and had severe trama injuries. I shall update you all if the test comes back positive, but it seems likely that this canine had an unfortunate collison with an automobile. Bet you all wondered why no blogging this weekend. 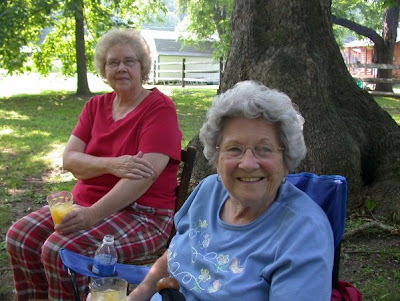 Judy and I took Mom Meads to Pix and Dan's retreat on the Greenbrier River at Seebert. 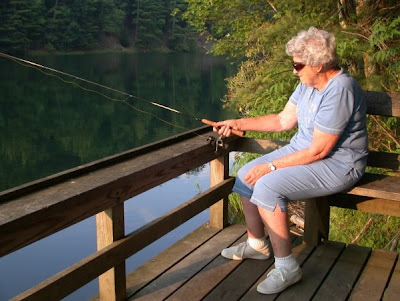 Mom had not been fishing for several years so we did the fishing adventure on Watoga Lake on Saturday morning and again on Sunday evening. Saturday was not too productive. 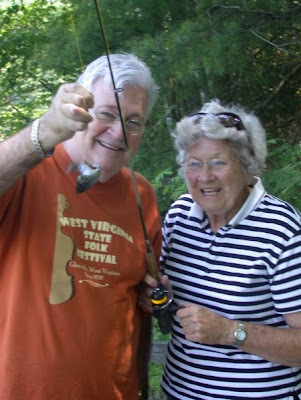 Mom caught a small bluegill and it went back into the lake. Mom said "Now that was big enough to eat!" I assured her that it would not make a mouthful. 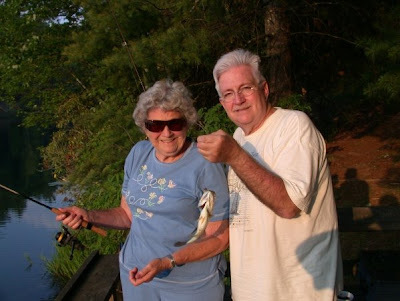 I caught a small bass, but once again it was (thankfully) not large enough to keep. This weekend was beautiful. It was warm and sunny. We had gourmet meals. 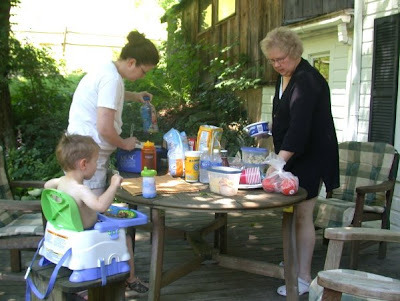 Mom Meads and Judy are watching me cook the polish sausages. 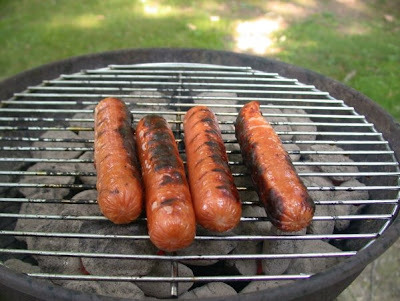 Notice the dark areas of wonderful third degree burns that always makes a hot dog tasty. 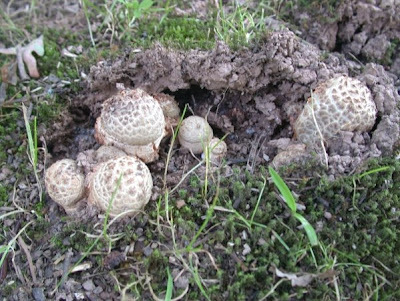 As I was grilling, I noticed at the base of Mom's chair a group of puffballs (maybe) located next to the wonderful large oak tree. These fungi fruiting structures were popping through the dry yard waiting for the next rain. 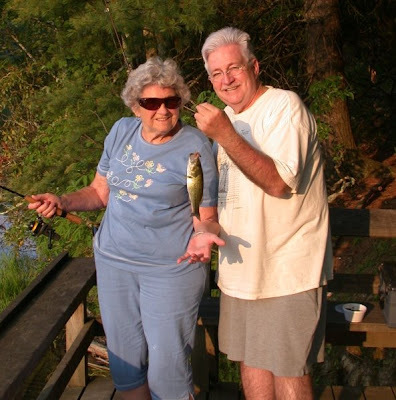 Back to Watoga Lake on Sunday evening and the fish were certainly more cooperative. 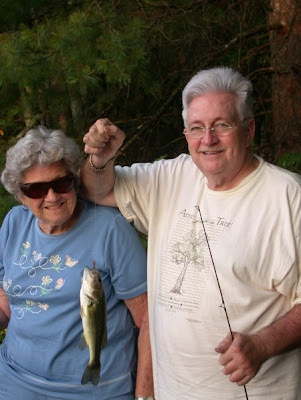 I caught this small bass and once again - NOT BIG ENOUGH TO EAT! Do you get the idea that I do not cherish cleaning the critters? Ok, this one was in the eating range. I cleaned the beast and we fixed it for breakfast this morning. Mom Meads was excited and enjoyed eating every morsel. We arrived at Seebert on Friday and left today. 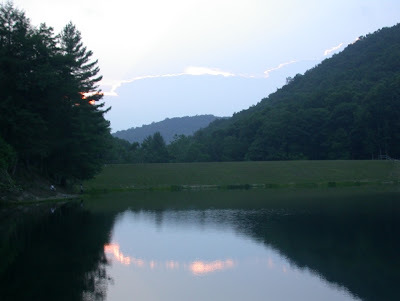 Last evening on the lake was magical with the green frogs making their unique banjo-like calls. Thanks again to our friends for sharing the resort with us! This is from AutoBlog concerning the emails that you all may have received. Hundreds of tips about this amazing discovery have been pouring in for months. They all have in common the story of a New Yorker's retirement gift to himself – a house on a few acres in Portugal. 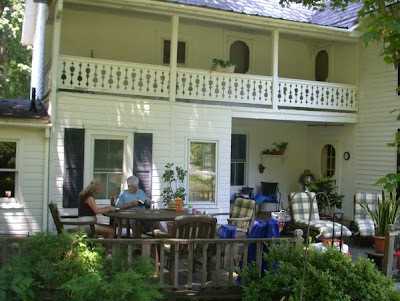 The house he found had been vacant for 15 years, the owners having passed away leaving no heirs. The property was being sold to pay back taxes owed, and besides the house, there was also a large metal barn on the land with its doors welded shut. Nobody took the time to see what was inside, so the property was sold as is. When the new owner and his wife arrived, they got to work opening up the barn and found - the barn find of the millennium. Inside the structure sat around 200 dusty classic cars. What an unbelievable bit of luck for the new owner! Follow the jump for the real story. [Source: Old Cars Weekly] And we do mean unbelievable. Of course the whole thing was a net hoax, but some people still want to believe it is true, and so the story continues to circulate. After all, there's a whole gallery of dusty classics sitting in a dark warehouse that's pretty compelling. How could it be a lie? Old Cars Weekly just tracked down the story behind the story, and the real explanation is almost as good as the hoax. What we are actually seeing in those pictures is the collection of an automobile dealer who over the years has added many vehicles that caught his fancy. He just drove them to the barn and parked them there, presumably waiting until he decided what to do with the lot of them next. About a year ago he sent in a photographer to document the collection, and those pics are the ones circulating the internet, helping to create and sustain this myth. So now you know the truth behind the Great Portugal Barn Find, and you all can stop sending us tips to cover it. Okay? I do not know about you all, but the Meads guy finds these hoaxes most interesting. See a partial list of this collection by clicking below. Here are more photos of this dusty car collection. Good Day! The video above has been going around the internet for over a year, but it is such a great clip of the wonders of the ocean environment. Enjoy it again! David Gallo works to push the bounds of oceanic discovery. Active in undersea exploration (sometimes in partnership with legendary Titanic-hunter Robert Ballard), he was one of the first oceanographers to use a combination of manned submersibles and robots to map the ocean world with unprecedented clarity and detail. Another great ocean scientist is Sylvia Earle. 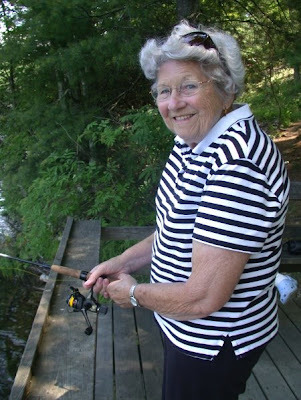 Judy and I had the pleasure of meeting her at a science conference at Snowshoe. She is an amazing treasure. Sylvia Earle is the best-known woman marine scientist on the planet. Among other accomplishments, she has walked untethered on the sea floor at a lower depth than any other human being. When Sylvia Earle first began her career, she met resistance. Some people could not accept a woman traveling with men on long scientific expeditions, but her remarkable accomplishments have won her a position in the oceanographic community that transcends boundaries. Botanist, biologist, conservationist, entrepreneur, Sylvia Earle has followed whales in the open sea, fought with sharks, and lived for weeks at a time on the floor of the sea, in the Tektite undersea station. She has challenged and overcome every obstacle that stood in the path of her burning curiosity about the magical world beneath the waves. 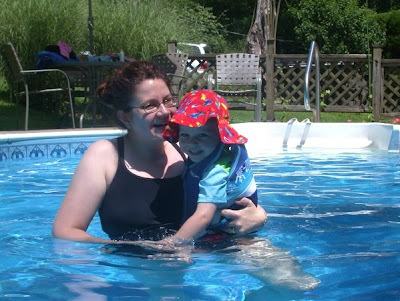 Our friend, Diana, invited the Meads and Dodson family out for a noon lucheon and swim. 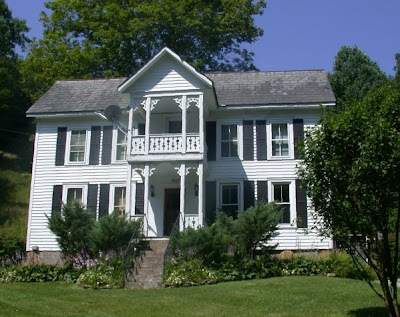 Her house is over 100 years old. It is a lovely place. 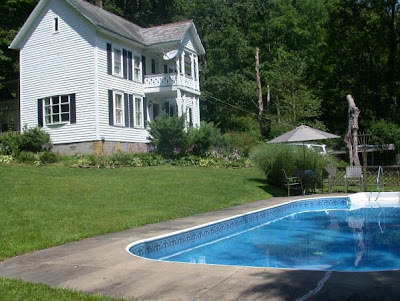 Several years ago they added a swimming pool. The swim was great. It was sunny and 90 degrees today. 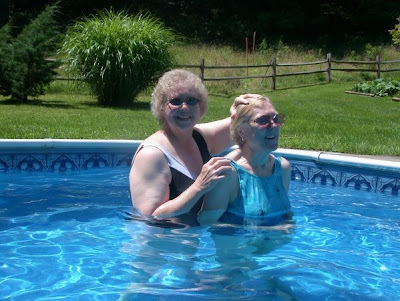 In the photo below, Judy and Diana are planning their Ester Williams routines. Esther Williams is a retired United States competitive swimmer and movie star of the 1940's and 50's She was famous for her musical films that featured elaborate performances with swimming and diving. 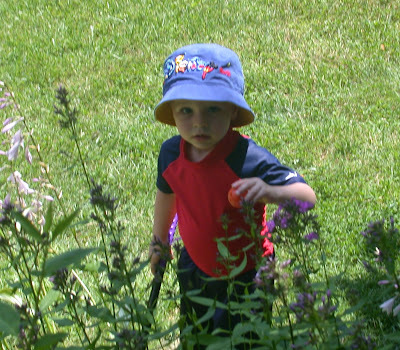 Sam, on the other hand, is checking out the techniques needed to enter Diana's aquatic environment. Dad Jeff is assuring Sam that there is no problem. 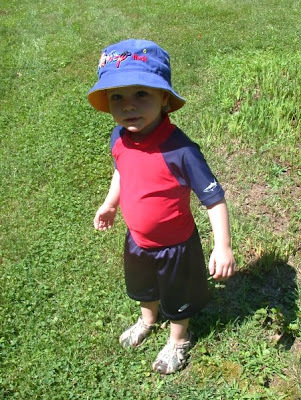 Next week Sam starts swimming lessons at the Bridgeport city pool. Success! 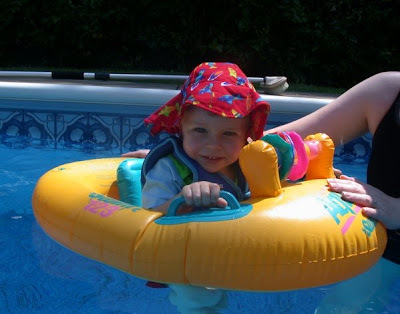 Sam is safely in his float. 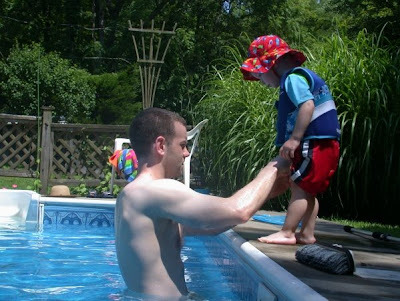 Grandpa is explaining the techniques that Sam needs next week during his swimming lessons. 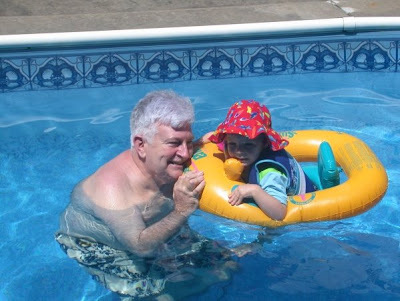 Grandpa is also telling Sam how he swam the English Channel! 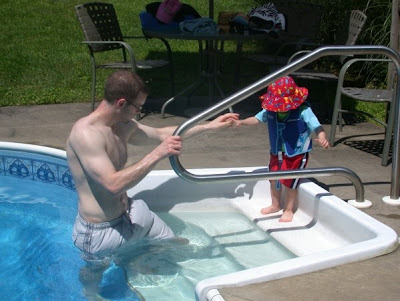 It is out of the float and on to jumping into the pool with Dad's help. Oh what fun! Diana surveyed the pool. 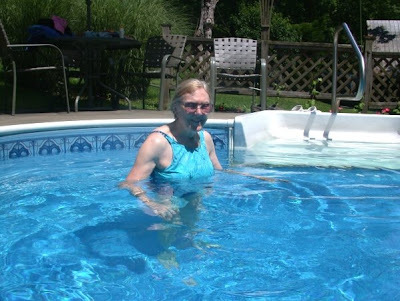 She was the entomologist in residence and proceeded to extract bees from the pool's surface. 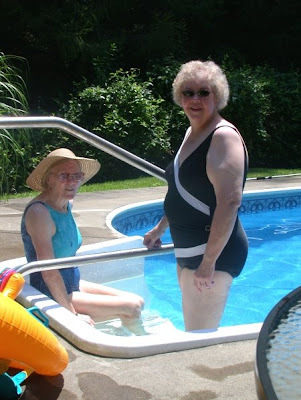 I am not certain what Judy and Diana are doing. 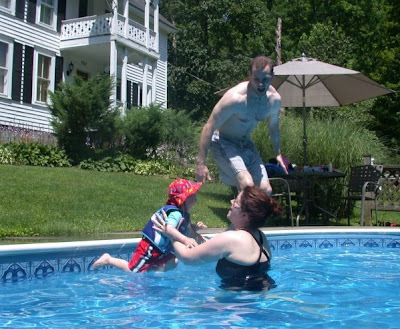 It looks like a baptism to me! 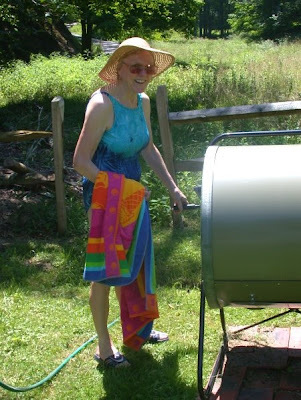 I checked out Diana's new composter. This lady is amazing. The composter came in a flat box. The instructions for assembly states that 2 people are needed to put this critter together. Diana did it herself (while shouting strange vocabulary during the setup process). It was time for lunch. We had wonderful sandwiches. Diana supplied shrimp cocktail. Yummy. She kept track of the number of those crustaceans that I devored. 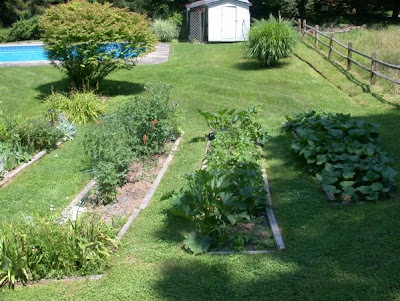 Diana does a great job in her gardens and yard. The plants are thriving. 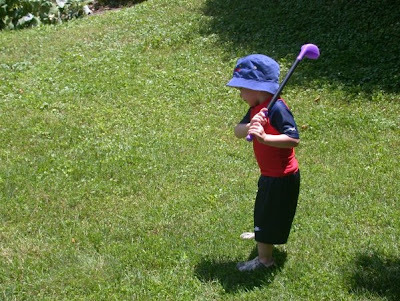 After lunch, Sammy and Dad played golf in Diana's fairway. What happens when you get your ball in the flowery rough? What would Tiger Woods do in a time like this? It was late afternoon and time to go. 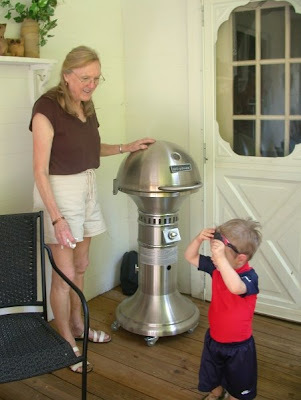 Sam was interested in Diana's space-age grill. Thanks Diana for a wonderful afternoon!